We started with the two peaks furthest from the pavement, almost eight miles worth of driving. We turned off White Mtn Rd at the dirt Crooked Creek Rd signed for the UC Research Center. We passed this and spent almost an hour driving the remaining seven miles to the peaks. Zdon recommends walking the last 4-5 of these miles due to damage that vehicles have made in boggy areas where the creek crosses the road. In the current drought conditions, there was no water actually running in the creek, probably as dry as it has been in decades in June, and we found no such boggy places. The two summits lie on a high plateau above Crooked Creek to the east, separated from each other by less than a mile. Despite this, we lazily drove to each separately, getting as close as the roads would permit, which in these cases meant less than a quarter mile. Sage Hen had less than 200ft of gain, an easy stroll over low desert scrub. From the summit we could see White Mtn Peak to the northwest, a familiar sight that could be seen from each of the summits we visited. John Vitz had left a handful of pages to serve as a register in 1996, Sue & Vic Henney adding a notebook in 2011. Ours was the first entry in three years on this seldom-visited summit. We returned to the Jeep and drove close to Iron Mtn's summit on a faint road we had spied from atop Sage Hen. The hike to the top was embarassingly short, all of seven minutes. Iron had a much older register, a MacLeod/Lilley version from 1979 that has proved slightly more popular than Sage Hen's. I snapped a picture of the benchmark, Tom and the register pages before we descended back down the slopes. Red Peak is located a little more than a mile west of Sage Hen across Crooked Creek. We drove several miles back down to Crooked Creek along the road we had driven in on, to our starting point a mile and a half north of Red Peak. We were happy to find a very good use trail (it appears to be a cattle trail between pasture areas) shortly after crossing over Crooked Creek (a trickle of water found here). We followed the trail for more than a mile until we were at the northwest base of the summit, less than half a mile away. More low scrub covered the easy slopes we climbed to the summit. Another John Vitz register was found, this one with three pages. So far, Vitz and the Hennys were in all three registers, apparently doing a similar peak-hopping venture like ourselves. The summit has a brownish tint and if you use your imagination you can almost see how the peak was named. On the way back we took a slightly different route off the summit to allow us to pick up the trail sooner than we would have otherwise, following it back to the start. We spent an hour and forty minutes on this one with about 1,000ft of gain - at least we were breaking a sweat now. We drove a short distance north on a spur road to Deep Springs Cow Camp. It's pretty darn far from Deep Springs Valley, but it appears to be a summer grazing area for the Deep Springs College located down in the high valley for which it's named. The camp currently consists of two small cabins sparsely furnished for sleeping, avoiding mosquitoes or staying out of the rain. Not that it rains here much. We hadn't seen a mosquito yet and I don't think I'd want to stay in one of these hantavirus incubation chambers. After examining the cabins we drove a short distance further to a fenceline, about 3/5mi from the summit. With a bit more brush than the other peaks and some loose boulder fields to contend with, this 700-foot climb seemed harder than the 30min it took us to reach the summit. The Vitz register we found here was far more popular than any of the others - perhaps the ranch hands need something more to do than watch the cattle mow the grass. One of the entries had a more modern term for cowboys - "The Deep Springs College Management Resource Team". If you haven't heard of this unusual college that combines a free liberal arts education with farm/ranch work, check it out online. We detoured off the summit to find an old road we'd seen from the summit but found it offered no advantage. An hour after we'd started out we were crawling back under the fence to the Jeep. 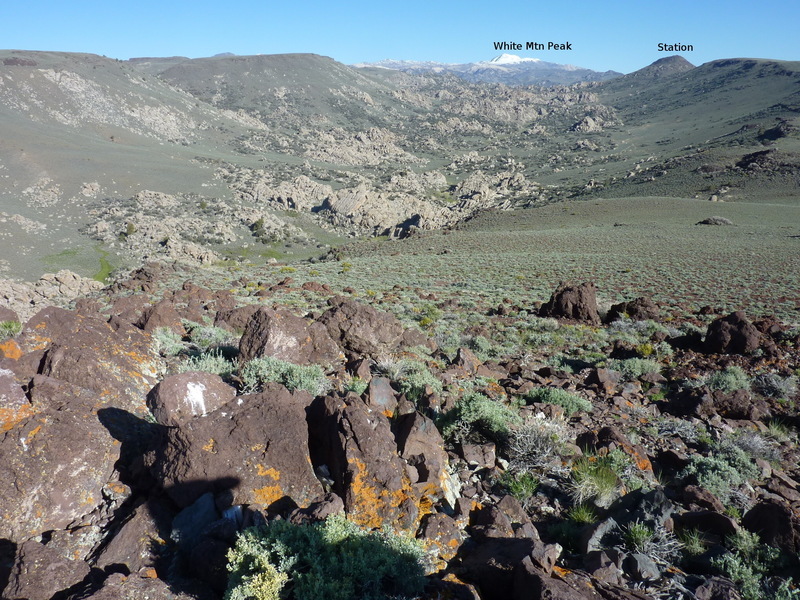 Located two miles west of Red Peak, the two share similar hikes - about 1,000ft of gain over 3.5mi round trip. From where we parked at the junction of the North and South Forks of Crooked Creek, a good cow trail leads south towards Bucks Peak and Sage Hen Flat. Once at the base of the mountain on the north side, Tom and I split up as he headed slightly left to a saddle for lower-angle climbing and I went up the steeper, more direct route. Tom found a use trail halfway to the saddle which proved just the extra bit he needed to beat me to the summit by a few paces. A plaque located at the summit commemorates a 25yr-old Deep Springs Cowboy who would have been just a few years older than myself if misfortune hadn't befallen him. A busy MacLeod/Lilley register had entries by Vitz and the Henneys again, though not the same dates as those on the previous peaks - we were beginning to out-bag the lot of them, thanks to the Jeep. We both returned via Tom's route with the use trail that we followed until we lost it lower down the mountain. We soon picked up the original cow trail and followed it back to the Jeep. Just before we returned to White Mtn Rd, we searched for a Jeep road heading south towards Blanco Mtn. Finding it, we were dismayed to see that travel along it was no longer allowed, requiring a hike of 2mi, one-way. It was around 2:30p by this time and we had to admit we were starting to get tired and probably couldn't manage all nine that I had planned. We decided to triage the remaining peaks, leaving this harder one for another time. This would leave us enough energy for two others that were shorter. It's a funny use of the word "hill", for an 11,000-foot summit with more than 800ft of prominence. Though the hike was only about a mile and a quarter each way, it gained more than 1,000ft. We drove south on White Mtn Rd looking for a turnout and a good starting point on the peak's west side, not finding one until we were almost a mile SSW of the summit. Another vehicle was parked here and we could see a use trail heading up a steep draw so we guessed it might be the unofficial summit trail. Turns out the trail only went up the draw, not to the summit, but it worked anyway thanks to brush that wasn't much trouble. We came across two older gentleman on their way down as we were heading up (older here is relative - they weren't that much older than Tom and myself), undoubtedly the occupants of the other vehicle. In passing I commented, "Popular summit," to which one of them replied with a chuckle, "At least today!" We found no register at the top, the first time for missing one. To the southeast rose Blanco Mtn, mocking us it seemed, only a mile and a quarter distance. The distance wasn't the problem for us at this point, but the high valley between them that required dropping and then reclimbing almost 1,000ft. Neither of us felt like we had that much left in us, so we returned the way we came down the draw to our car. Two miles NNW of County Line Hill, Campito Mtn lies only half a mile off White Mtn Rd. It looks deceptively close when one starts out but there is more than 700ft of climbing, some of it on crappy talus before one reaches the summit behind a false one. I'd have probably called this one trivial if we'd started on it in the morning, but in the late afternoon it was as much as we could manage with a smile. We took a little less than 30min to climb to the top, finding a cairn but no register. 45min after starting out we were back down at the road.